Well, we don't have a section yet to talk about the new Vintage Collection (TVC) coming out later this year, so I am going to plop this here until we have a new section. I was stoked to read this morning (from HansHideout) that Hasbro is going to be releasing a Senate Duel Darth Sidious. YES!!!! 1) You know us collectors - we're never satisfied. We get a whole pile of goodies lavished on us at Toy Fair and most already can't help but wonder what's next? We know you want to keep things under wraps until SDCC, but can you at least give us the mix you're expecting for 2010 Vintage Wave 2 - how many "new" figures and how many repacks will we see in the second Vintage Collection wave? ** EpIII is the theme for Wave 2 of Vintage, with eight figures will be brought in (seven from EpIII and one from EpIV). 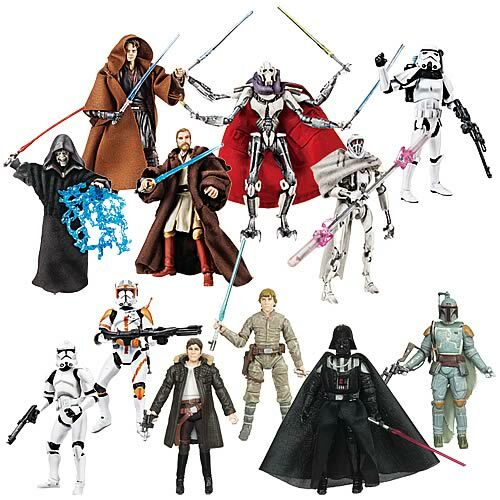 Of the seven, four will be upgrades of previously released characters (including an all new Senate Duel Darth Sidious) and the others are "greatest hits" style figures. nice figures! can't wait to see them in stores! does anyone know if there will be any new/remake ewok figures this year "2010"??? I think we are going to get a resculpt for Wicket. I'm not sure where I read it, but I am sure that I read that somewhere. I'm with you there. I could take a whole army of these guys. All Hasbro needs to do is pick two good sculpts, paint them in various colors, throw in a few different types of headgear, and then we would have an entire Ewok colony on our hands. That would be awesome! "I hear, a new apprentice you have, Emperor. Or should I call you....DARTH SIDIOUS?" I am not into the hard plastic hood, though I think if I put him in a black cloth robe with a hood he'll be perfect. And Evil. So I guess that would make him perfectly evil. It's interesting that you say that, since I think the plastic hood is quite necessary to pull off this great figure. One huge complaint I have about previous incarnations of the Emperor figure is that the soft-goods material is just not conducive to making his hood look realistic. It usually cones up in the back, or covers his face too tightly. A plastic hood solves this problem. I think Hasbro found the perfect balance between plastic and soft-goods here; now I just want them to offer a similar-styled Emperor figure from Return of the Jedi. I sure hope one of those cushions is removable - I want to be able to place the Legacy Leia right there in front of that ugly slug. Nice pic! I wonder when it will be out. I haven't been buying much, but I'll likely buy that. Removable cushions? They don't look that way to me, but that would be nice.